UPDATE: Who Are Rubashkin And His Rabbis Counting On? Could It Be Rubashkin's Brother-In-Law Rabbi Milton Balkany – The Infamous 'Brooklyn Bundler'? First, we have a scandal involving the misuse of almost $1,000,000 in Federal grant monies meant for disabled students. And then it seems that Rabbi Balkany and his institution owed OHEL – an institution that serves mentally handicapped Jews – and it's director more than $100,000 in back rent and more than $50,000 in personal loans. Do you wonder if Rabbi Balkany is involved in the USDA's stonewalling of the Rubashkin investigation? If I were a betting man, I'd put my money on heavy Balkany involvement. Look at his track record. UPDATE: Here are two more articles on Balkany. 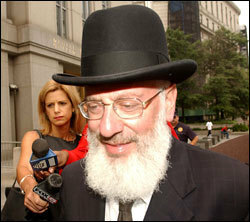 The first, Jail Breaks – Influential Rabbi Barred From Lobbying Federal Prison Officials. The second is a recap of the Federal indictment, including the threat to have an Orthodox aide to a sitting US Senator excommunicated after the aide wrote memos complaining about Balkany's heavy-handed efforts to compel Israeli government officials to use U.S. aid money to fund projects Balkany favored in Israel.